The essential Emma Johnson (Concertos by Mozart, Crusell No.2, Arnold No.2) and smaller pieces 2CDs ASV DCS 238 74'52" & 76'22"
This is a useful compilation double CD of Emma Johnson's earlier recordings (1986-95). 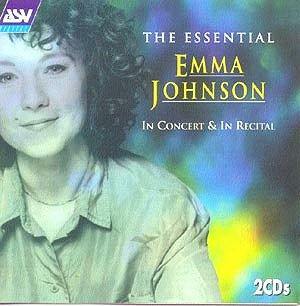 Marketed as The essential Emma Johnson in concert and recital it is really neither. She is accompanied by the English Chamber Orchestra under three conductors over a ten year period, and by three pianists in short pieces, with harpist Skaila Kanga for Paul Reade's Victorian Kitchen Garden. Besides the Mozart concerto, recorded with assurance and complete aplomb in 1984 when she was only 17, we have Schumann's Fantasiestucke and Finzi's Five Bagatelles plus two other concertos and a multitude of arrangements for clarinet, mainly of popular pieces. Bernhard Crusell was the first to perform the Mozart concerto after its publication in 1801; his name is probably better known now because it was with one of his clarinet concertos that Emma Johnson captivated TV viewers and the judges to become BBC Young Musician of the Year. There is a remarkable record of woodwind victors (in competition with piano and strings) achieving great careers, e.g. Michael Collins and Nicholas Daniel, oboist, who featured another rarity, the Vaughan-Williams oboe concerto. Emma Johnson now has world-wide fame as a soloist, but she is also a committed chamber musician, with her own group of Emma Johnson and Friends, this aspect of her work not represented here. The F minor Crusell concerto is a delight, exploiting the clarinet's potential in dramatic and wistful melancholic moods. Baermann's Adagio goes well with its string quartet accompaniment on string orchestra. Malcolm Arnold wrote his second clarinet concerto for Benny Goodman, who premiered it in 1974, jazzy as you'd expect, the finale a witty Pre-Goodman Rag. There are good accounts of the Mozart and Schumann works which are cornerstones of the clarinettist's repertoire; I do not venture to attempt comparative criticism, and find no fault with the orchestral CD. The Finzi pieces are heard less often, a welcome example of his individual contribution to 'English pastoral' music. But to my mind there are far too many short arrangements for clarinet, variably successful, to make of the second CD a satisfying recital, with 27 mostly short pieces by 13 composers. Rachmaninoff's Vocalise has nothing special to say on the clarinet, likewise Rimsky's Bumblebee. You also get Howard Blake's snowman walking in the air - I enjoyed that one! Take it for what it is, don't attempt to play either CD straight through, and there is a lot of enjoyment to be had. I would welcome, however, a new CD of Emma Johnson's own favourites, compiled to her personal choice - it could be very interesting. She is playing marvellously as ever nowadays, giving delight through her charm and wholehearted commitment, which is always communicated in her frequent live appearances, where she really excels.